It is a custom made clear – aligner system. Multiple transparent aligners (trays), generated by a computer simulation, apply incremental forces to move teeth to the desired position in the arch in order to achieve straight teeth and a beautiful attractive smile. 1. Clear and Invisible. People will not notice when you are wearing the trays. 2. Smooth and comfortable to wear. 3. Removable. You can take the trays out and enjoy all type of foods. 4. Oral hygiene is not compromised. You can take them out to properly brush and floss. 5. Unlike braces, you do not have metal brackets and wires wrap around teeth and gum. 6. Invisalign treatment is covered by most insurance plans. 3. Treatment plan - Dentist will set a customized treatment plan to achieve the goals. 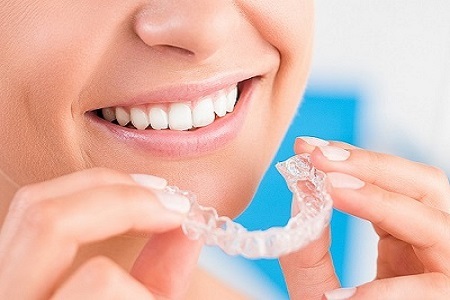 Invisalign company will fabricate a set of aligners to shift teeth gently into the desired place. 4. Treatment in progress - Patient will wear set of aligners for about 20-22 hours per day, and will change the aligners as directed by the dentist. Patient will have regular check-ups every 4-6 weeks at the dentist office (or as directed by the dentist) to monitor the teeth movement. There are various reasons why teeth are crocked, spaced or misaligned. If a child loss a tooth prematurely (for example due to extensive tooth decay), then the space (after baby’s tooth removal) should be reserved with a space maintainer appliance to ensure that the permanent adult opponent tooth has adequate space to erupt successfully. It is crucial for children to visit a dentist on regular basis and have the eruption of their teeth and jaw growth monitored. Sometimes dentist would recommend appliances like upper maxillary arch expander which offers great benefits in widening the upper arch and helps resolve many issues in jaws and teeth. There are different materials like ceramic and metal. The most popular is metal. Brackets will bond to the teeth and a wire will go through the brackets. There has been lots of advancement and new technologies in the market like Arch wires which can be activated through heat, meaning it uses the body heat to move teeth efficiently and less painful. Brackets nowadays are smaller and less noticeable than it used to be in the past.